There are many studies about the Romans in eastern Africa (Somalia, Kenya and Tanzania coast). Some are done by Felix Chami, professor at the Dar es Salaam university (read http://www.academia.edu/15058889/Metropolis_of_Rhapta_and_Azania -----&-----http://nabataea.net/juani.html ). This academic professor is detailing with his researches the Roman presence in the Tanzania coast, a region used to be called in classical centuries with the name "Azania" and that had as the main port a city called "Raphta". Of course we must pinpoint that Romans had a huge commerce for centuries with Raphta, that was the southernmost locality which was possible to reach from their Red sea port of Adulis using the Monsoon winds. During Caesar times, the port of Rhapta (located near Dar es Salaam in Tanzania) emerged as the principal commercial center on the east African coast. With increasing trade, groups of professional merchants and entrepreneurs emerged at Rhapta, and coins came into general use on the east African coast. Merchants of Rhapta imported iron goods such as spears, axes, and knives from southern Arabia and the eastern Mediterranean region controlled by Rome in exchange for ivory, rhinoceros horn, tortoise shell, and slaves obtained from interior regions. Indeed Ptolemy goes on to itemize a long list of towns and ports all down the eastern seaboard of Africa. Some scholars believe that his knowledge of the coast extended as far south as Cabo Delgado in northern Mozambique. Ptolemy included details of the latitude of each place he mentions. The most intriguing of these is a port called Rhapta which is also mentioned in a book written by an unknown Greek author called the Periplus of the Erythraean Sea. The Periplus is probably the most comprehensive documents we have of the ancient world of the Indian Ocean. According to the most thorough translation by Lionel Casson: "Two runs beyond this island comes the very last port of trade on the coast of Azania, called Rhapta, where there are great quantities of ivory and tortoise shell." A ‘run’ is about 100 nautical miles. The mysterious island is very likely Zanzibar which means that Rhapta would have lain at the mouth of the Rufiji River in Tanzania. This is supported by finds by the archaeologist Felix Chami of the University of Dar Es Salaam in which he uncovered Greco-Roman pottery and Syrian glass. Even more recent discoveries based on his reading of Ptolemy have led to his unearthing shards of pottery and human bones on Juani island off the coast at Rufiji which point to extensive East African trade in the ancient world. It is possible that the island the Periplus talks of is the larger Mafia island off the Rufiji delta which would then add further evidence to the Romans and Greeks being familiar with the coast as far south as Mozambique. Even old Chinese documents point to the likelihood that the Greeks and Romans were familiar with the east and southern Africa. The fragmentary remains of text and footnotes of the "Weilüe" -an account of the Wei dynasty by historian Yu Huan written in the third century- refers to the ‘kingdom of Da Qin’ (which was Rome) and the territory of ‘Zesan’ which scholars believe is likely to be a corruption of ‘Azania’, the Roman and Greek name for the East African coast. Section 15 – The Kingdom of Zesan (Azania). The king of Zesan (Azania) is subject to Da Qin (Rome). His seat of government is in the middle of the sea. To the north you reach Lüfen (Leukê Komê). It can take half a year to cross the water, but with fast winds it takes a month. (Zesan) is in close communication with Angu city (Gerrha) in Anxi (Parthia). You can (also) travel (from Zesan) southwest to the capital of Da Qin (Rome), but the number of "li" is not known. Furthermore we have to remember that the emperor Augustus planned an expedition around Africa with roman ships starting from the Red Sea, but it was never done. Coins survive for centuries and are reliable indicators of extensive trade, but they can be carried for thousands of miles in a leather pouch or even someone’s pocket so they are uncertain indicators of any Greek or Roman presence in southern Africa. Nonetheless, Victorian archaeologists searching the ruins of the civilization of Great Zimbabwe found a coin from the reign of the Emperor Antoninus Pius (AD 138 - 161) in an old shaft near Mutare at a depth of nearly 25 metres which indicates an age of some antiquity. Curiously, too, a Roman coin from the reign of Emperor Trajan (AD 98 -117) was found on the Congo River about a century ago. Furthermore, J. Innes Miller points out that Roman coins have been found on Pemba island, just north of Rhapta, and Germans of Tanganika found two Roman coins in Kilwa Kisiwani on an island next to the Mozambique border (read http://www.tandfonline.com/doi/abs/10.1080/00672706609511349?journalCode=raza20 ). Indeed on the central Mozambique coast, Dundo and Chibuene have produced glass beads from the Mediterranean sea and Middle Eastern pottery of mid/late first-millennium age. An Omani green glazed ware fragment at Chibuene suggests that contacts reach back to the early fifth century (read http://www.researchgate.net/publication/265050510_Glass_finds_from_Chibuene_a_6th_to_17th_century_AD_port_in_southern_Mozambique ): these contacts from Chibuene (located south of the Zambesi river delta) probably reached the highlands of what is now Zimbabwe. This suggest that probably agriculture was favored by roman commerce in the region of Africa that a few centuries later saw the rise of the famous ancient "Zimbabwe kingdom". In the fifth century the Roman commerce with Azania & Raphta seems to disappear, probably because of the barbarian invasions in Europe. This paper is another attempt to elucidate how the Graeco-Romans had extended trade links to the coast of East Africa and probably to the interior of East Africa. This undertaking is probably the first of its kind to collate a variety of archaeological evidence recently recovered from the coast and islands of Tanzania with existing Graeco-Roman documents. Previous efforts have relied mostly on historical data and few objects such as coins found in non-archaeological contexts. The focus of this paper is on how the Red Sea was used to facilitate contact between communities of the Mediterranean Sea and those of the Red Sea and East Africa or Paanchea/Azania. However, some evidence, published elsewhere (see for example Chami 2002a, 2002b), may also be used to show that similar contacts existed between East Africa, the Middle East and south-east Asia. The present work comprises the new archaeological finds from the Tanzanian coast of 2000-2002. Also the work utilizes, with much more confidence, data from early Graeco-Roman documents hitherto referred to as fairy stories. It is important to define what is termed in this work as the Graeco-Roman period. The standard meaning obtained from the Random House College Dictionary is that of a period having both Greek and Roman characteristics. Such characteristics occurred in the period when the Romans took over the empire of the Greeks in the second part of the last century BC and hence they fused together both Greek and Roman influences: this process continued until about the end of the 3rd century AD. The use of the concept "Graeco-Roman" in this work extends further back to cover the period following the death of Alexander the Great in 323 BC until the end of the 3rd century AD. With this definition, the Graeco-Roman period thus can be divided into two phases. The first phase is the one in which East Africa is linked to the economy of the Mediterranean world via the Red Sea. The emerging historical and archaeological data portray the existence of contact between the regions of the Mediterranean/Red Sea and East Africa beginning from about the early 3rd century BC. This is the period when the Greeks had taken over the control of the eastern Mediterranean and Ptolemaic rule had been installed in Egypt, Greek sailors sailed in the Red Sea and had probably reached East Africa. The second phase of Graeco-Roman economic links with East Africans during the Roman rule of the Mediterranean Sea beginning with the reign of Caesar Augustus, from about 27 BC. Due to the eminent power of the Arabs in the Red Sea and in the northern Indian Ocean in the last century BC, the late Ptolemaic rule and the early Roman rule may have linked with East Africa along the Nile via Meroe (for conspectus see Chami 1999a). It was in the time of Caesar Augustus, more so after the BC/AD changeover, that Graeco-Roman sailors and traders were opened to the Indian Ocean through the Red Sea. Arab power was crushed and Aden, the town controlling the trade from the Indian Ocean to the Red Sea, was destroyed by the Romans (see Begley and de Puma eds 1991; Cinimo 1994). The extension of the Roman economic influence to the Indian Ocean reaching the Far East and East Africa probably created an unprecedented world economic order not so well documented before. The new era is known to have lasted three centuries until the Roman control of the Red Sea and the Indian Ocean passed to the Aksumites and Sasanians respectively (see Whitehouse and Williamson 1973). The earliest Graeco-Roman document discussing East Africa, then called "Paanchea", is that of Iambulus, a work preserved in Diodorus (see Oldfather 1961). This document offers in detail a forced travel of Iambulus from somewhere on the Horn of Africa/Red Sea to islands of East Africa, at the equator, in about the 3rd century BC. Recent scholars, and indeed the ancient scholars, doubted the authenticity of Iambulus report rating it as fantasy (see Cary and Warmington 1963, 241). Key aspects of Paanchea in Iambulus report are: the existence of seven islands populated by people practicing similar culture, literacy and a communal but quasi-Neolithic mode of production. The people of the islands were religious believing in the sun and stars. Another aspect of Iambulus report is the ancient sailing. His trip was done within six months from the Red Sea and when he left the islands, after seven years of stay, it took him a similar time to reach the north-west coast of India. The report suggests that the three regions of the Red Sea, East Africa and India were in contact. Another person known to have visited Paanchea at the time of Iambulus is Euhemerus, yet his report was also doubted. Another contemporary, Eudoxus, is said to have reached the coast of East Africa after being forced by monsoon winds when sailing to the Red Sea from a mission in India. It was this accidental voyage that led him realise that one could circumnavigate Africa and that people of the Atlantic Ocean based at Gades in the modern coast of Spain had reached the coast of East Africa from the south. It has been noted that Roman scholars were skeptical of their Greek predecessors knowledge of East Africa, referring to it as fantasy. What should be noted here is that the Greeks found Egyptians having the knowledge of Paanchea (Cary and Warmington 1963, 240) and must have learnt from them how to reach East Africa. It would seem that Egyptians had kept the secrets of East Africa for several millennia as "Paanchea" carries similar phonetic sounds like "Pnt", which although recent scholars have read it as "Punt", could actually have read "Pwanchi". The territory was later identified in the Roman period as Zangion or "AZANIA" with the focus being much more on the Ocean or "za" as opposed to the coastal land or "Apwanchi". The same territory was identified in the Islamic period as Zanchi meaning "land of Za" (see Chami 2002b). The people of the East African coast still refer to their coastal strip as "Pwani", which preserves the phonetic sounds in "Punt" and "Paanchi". Although Punt has been located, unconvincingly, on the African coast of the Red Sea (see Kitchen 1993) new evidence points further south, as the Greeks who reported to have reached Paanchea, also given the location at the Red Sea area, sailed for several months from the Red Sea in the general direction of East Africa. Paanchea was reported to have had large settlements, the largest of which was called Panara. Whether the capital was located on the island or on the coast or the interior is not mentioned. However, Strabo who also compiled data from his predecessors, i.e. Hipparchus (2nd century BC) and Eratosthenes (3rd century BC), described the climate and some cultures of the deep interior of East Africa (see Jones 1960). These included well populated wet highlands, and there were people in some parts of the interior who ate locusts, as indeed is done today by the people of the Great Lake region; according to Pliny some inhabitants smeared themselves with ochre (see Rackham 1961, 479), an aspect well attested today ethnographically and archaeologically for the Rift Valley people. Another important aspect of the Red Sea-East Africa relationship is the trade in spices, particularly cinnamon and cassia, reported at this time to have been reaching the Mediterranean and the Red Sea worlds from East Africa. Indeed Iambulus mission was in search of spices. Paanchea was reported to have traded spices with Arabia, another reason suggesting that the country was East Africa rather than the Red Sea coast of Africa. Strabo speculated the origin of the cinnamon and cassia to have been near the Nile Sudd. However, Pliny corrected him suggesting that it was the East African Acave dwellers@, who had been related to the people of the Red Sea, who brought the spices from a place far in the Ocean, pointing to south-east Asia (Rackham 1961, 63). As it will be shown later the Late Stone Age/Neolithic people on the islands of Tanzania lived in caves. The second phase of Graeco-Roman literature is that of the early centuries AD comprising the celebrated Periplus of the Erythraean Sea and Ptolemy's Geographia. This historiography has been thoroughly discussed by other scholars (see translations by Schoff 1912; Huntingford 1980; Casson 1989; and discussion by Datoo 1970; Kirwan 1986; Horton 1990; Chami1999a, 1999b). Only a few points need to be mentioned here. The Periplus, written in about AD 40-70, describes Azania as extending from a place south of Somalia to the general coast of Tanzania. An island, called Menuthias, probably to be identified as Zanzibar, is mentioned and an emporium called Rhapta is also described and probably located near the Rufiji River. The trade route connecting parts of the Red Sea to Azania and India is described and it is also reported that the Arabs of the Red Sea coast had controlled trade at Rhapta arguing that Azania was under their suzerainty. Ptolemy's Geographia, written in the 2nd century AD, adds very little to the Periplus apart from offering latitudes and longitudes to the settlements provided. The Geographia suggests the growth of more settlements and the development of Rhapta as a metropolis. The coast of Mozambique and the offshore islands were then known because it is here where Ptolemy places his Menuthias. Probably one of the most significant contributions made by Ptolemy's Geographia is the inclusion of data about the deep interior. One of the regular Roman visitors to Azania, called Diogenes, visited Lake Nyanza (Victoria), and knew about the Ruwenzori range of mountains (The Mountains of the Moon), the Uganda Nile and a mountain with three peaks probably Kilimanjaro (for conspectus see Huntingford 1980; Chami 1999a). Imports to East Africa included iron objects, wine and grain whereas exports included ivory, rhinoceros horn, tortoise shells, and coconut oil/nautilus shells. It was noted earlier that Graeco-Roman documents, actually of all periods, were of little use up to 1995 because the archaeology of East Africa had not recovered any evidence to corroborate the history. Whereas the Greek reports were not believed, Periplus and Ptolemy's reports were strongly approved because they were strongly supported by archaeological evidence, particularly from India and Sri Lanka. 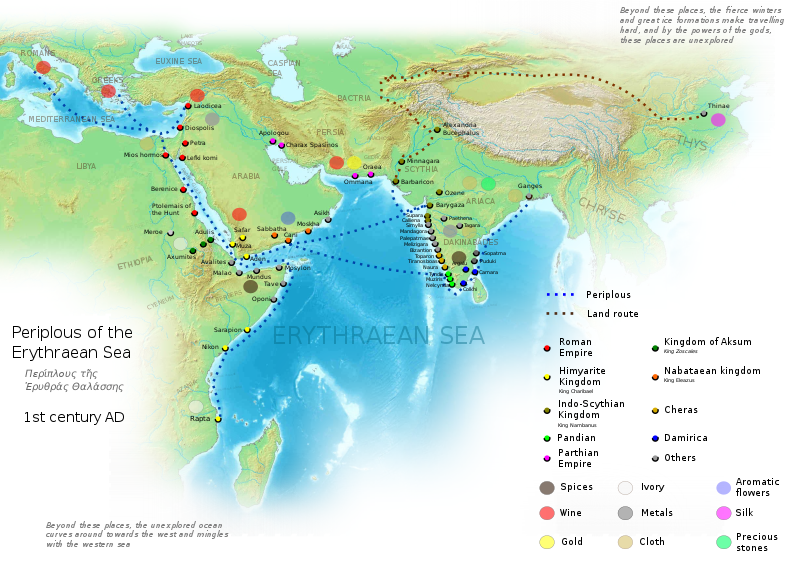 Moreover, Roman history corroborated sailing of the Roman traders in the Indian Ocean reaching as far as South Asia (see Begley and de Puma eds 1991; Cinimo 1994). The main thrust of this paper is to provide archaeological evidence spanning the period of GraecoBRoman era showing that there were settlements on the coast of East Africa linked by trade to the Red Sea and beyond. The earliest material evidence reported suggesting the existence of such settlements and trade link is that of Chittick (1966) who summarized the report of the finds of various coins of rulers of the Ptolemaic Egypt, Roman Empire and other rulers of the Middle East from the last centuries BC. As none of these were not found in archaeological contexts, the data is unreliable. The next material evidence for trade link between the Red Sea and the Indian Ocean was that provided by Chittick (1980; Smith and Wright 1988) from Ras Hafun. Here finds of Roman pottery in archaeological context dating between the 1st century BC and 3rd century AD were recovered. The problem with this site find, however, was that it was not directly pointing to East Africa and the same site could have been serving trade to India. The third material evidence linking the Mediterranean world with Azania, incontrovertible for the first time, was the report by this author, of "ROMAN BEADS" from the Rufiji Delta region dating back to the early centuries AD (Chami 1999b). The most important of those beads collected is a segmented gold/silver glass bead made on Rhodes between 100 BC and 300 AD. If the beads reached the coast of East Africa before the 1st century AD, it is probable that they could have come through the Nile Valley route via Meroe where similar beads are found (Welsby 1996). If they reached Azania after the BC/AD changeover, it is likely that they followed the Red Sea route as the Indian Ocean was not yet opened to the Roman traders, and such beads have yet to be recovered in the Red Sea or Southern Arabia. The fourth piece of evidence, also incontrovertible, consists of archaeological finds of both Roman and Indian material deposited in a limestone cave in Zanzibar, and also reported by this author (see Chami and Wafula 1999, Chami 2001). The artefacts include "ROMAN RED WARE POTTERY" similar to those reported by Smith and Wright (1988) from Ras Hafun (this and other finds have been illustrated in Chami 2002a). In association were green and blue glazed and non-glazed Persian wares and Indian beads (including a carnelian bead). A C14 sample from associated charcoal gives a date in the last century BC. Since then, discoveries of many trade goods have been recovered from the island of Mafia off the Rufiji delta (I illustrate this finds here with colour pictures for the first time since they were discovered in 2001-2002). The preliminary report of the archaeological work yielding these finds is found elsewhere (Chami 2000) and a more detailed report is under preparation (Chami, Sinclair, Nordstrom and Knutson forthcoming). The limestone shelter preserving these materials is found in the small island of Mafia called Juani. The cultural layer, a Late Stone Age/Neolithic with the materials, is now dated by C14 to the last part of the 1st millennium BC. Imported goods include both Graeco-Roman and Indian ceramics. The potsherds of Mediterranean origin are of great interest because they can also provide a relative date. Four potsherds are of marl clay from the Lower Nile region (Nordstrom, pers. comm.). Such pottery was known to have been traded by Egyptians to the Nubian Kingdom of Napata in about the 7th BC (Kendal 1997, 162). It is likely that this kind of pottery could have reached the islands of East Africa via the Red Sea in the time of Iambulus. Another important find is that of red painted ware identified by Sunil Gupta (pers. comm.) to be of Indian origin and dating from the early centuries AD. However, since the C14 dates for this ware are earlier (falling in the last centuries BC) and since this pottery is associated with Neolithic material rather than the Early Iron Age material found in the upper sequence of the cave occupation, the red painted ware must have reached the coast of East Africa before at least the BC/AD changeover. Vessels of red painted ware are also known to have been used in the Red Sea area in the late centuries BC and early centuries AD (Curtis/Sinclair-personal comm.). Another class of pottery found in the island of Mafia dating to the same early period is black ware also identified by Gupta to have belonged to the Early Iron Age of India. More than 25 potsherds recovered from the island of Mafia have been identified as of Indian origin. Another category of find linking the Red Sea and East Africa is that of beads now identified as Graeco-Roman. These include one Aeye@ bead and one mosaic bead described elsewhere by Dubin (1987, 60-61) as Hellenistic and Roman period dating from between 300 BC to AD 400 (for illustration see Chami 2002a). Dr St J. Simpson (pers. comm.) who saw the picture of the beads suggested that the Aeye@ bead Acould be pre-Islamic and there is evidence for both Roman and Partho-Sasanian from the Horn of Africa (e.g. Aksum and Ras Hafun). Prior to 1990 only historical documents existed to show that the Red Sea region had provided a vital economic link between East Africa and the Mediterranean communities. The communities of the Red Sea regions involved in this link included Nabataeans, Zoskales and Homerites/Sabaeans (see Casson 1989, 44). Although early (Greek) documents were known by modern scholars, no one seriously believed them and they were therefore not discussed in the historiography of Eastern Africa. Places such as Punt and Paanchea, mentioned in the early literature, were therefore placed in the Red Sea region (see Kitchen 1993; Phillips 1997). Although the literature of the Roman period was believed by most scholars, the tendency was to situate Azania and Rhapta more to the north of the eastern Africa coast. This was either due to racial biases in the thinking that it was only Hamites/Cushites who could have found trading towns (see Allen 1983; Horton 1990; Ehret 1998) or it reflected a lack of archaeological data. As suggested in Chittick's publications, the problem was how to substantiate the documents in the absence of archaeological records. In his effort to find Rhapta, Ptolemy's metropolis of Azania, Chittick (1982, 5Cool) had this to say before his death in the early 1980s: It remains possible that all traces of Rhapta have been washed away or buried. The summary of the archaeological finds presented above, gathered since 1990, by this author and his colleagues now incontrovertibly prove that the Greco-Roman documents preserved only a scanty, patchy picture of what happened in Panchea or Azania, now East Africa. I have already attempted to redraw the ancient cultural and economic system that embraced the Middle East, the Nile, the Red Sea and the Mediterranean territories in the ancient time (Chami 1999a, 1999b, Chami 2002a, 2002b). The archaeological data provided above adds to what I have reported before and hence strengthens my interpretation of the historical records. In view of what I have discussed elsewhere, only a few things need to be reiterated in this work. Firstly, East Africa had a thriving population with trade centres from the last centuries BC or even earlier. The people of the Late Stone Age who also domesticated animals like chicken, dogs and cats, first entered into contacts with other cultures of the west, north and east. It is likely that those Late Stone Age people of the coast of East Africa occupied caves as living houses or just for sanctuary. They used pottery and used small quartz pebbles to make their microlithic tools and blades. Apart from domesticates, they also hunted wild animals and fished. The culture of these people and its comparative analysis have been provided elsewhere (Chami 2001; Chami and Kwekason 2003). It would seem that these are the people identified by Pliny as cave dwellers known to have passed spices from south-east Asia to the Red Sea. Both Pliny and Iambulus have shown that the people of East Africa had cultural and trade relationship with the people of the Red Sea. Iambulus suggested that the people of the Red Sea coast sent him to the islands of East Africa as sacrifice to the people described as fair and good. The Periplus reported the claim by the people of the Red Sea, who were found trading and staying in Rhapta, that Azania was traditionally under their suzerainty. Chittick (1980) showed that the people of Ras Hafun, whose site was found to have trade goods of the last centuries BC, had also used stone tools like those of East Africa (also see Chami and Wafula 1999). It would however seem that by the time of the Periplus and Ptolemy, in the early centuries AD, the people of the coast of East Africa would have started melting iron. If this was the case, as testified today archaeologically (see Chami 1999b & c), then the people of the Periplus time in East Africa were already producing iron objects. The question is therefore why the main imports of the Azania were iron tools? Various explanations including that of exchanging bloom for fine and finished tools from the Red Sea or the Mediterranean regions has been suggested (Chami1999a; Mapunda 2002). We now know, from the archaeology reported above, that the Periplus does not provide the entire list of what was imported and exported. Iron bloom could be one of the major items of trade as the Roman empire required much iron to be used in ship-building and weaponry. In fact the Romans stimulated the production of iron all over the empire and the periphery (Tylecote 1976) and the increased production of iron in Azania, as seen today in the archaeology of East Africa could have been stimulated by such demand. Another thinking could be that the local production of iron did not satiate the local demand for iron tools required by the new agricultural communities of Azania then opened to the world market by the growth of Rhapta and other large settlements of the time. Importation of iron tools was then necessary to cater for the higher demand in the markets of Azania. Another controversy is whether coconut oil was exported from Azania to the Red Sea markets and beyond as recognized in the early translations of the Periplus (Schoff 1912). Casson (1980, 1989) has argued that it was not coconut oil implied in the Periplus but nautilus shells. The current archaeological finds, however, would suggest that south-east Asian domesticates such as chicken and banana had already reached the coast of East Africa from the last millennium BC, which indicate that coconut could also have been domesticated in East Africa at the same time (see Chami 2001). Another controversy, which can now be examined in view of the new archaeological finds, is whether it was East Africa which provided cinnamon and cassia to the Red Sea and the Mediterranean regions as suggested by Strabo and Pliny. Miller (1969) did suggest that it was the people of East Africa or Austranesians who got the spices from south-east Asia and trafficked them to the Red Sea and the Nile Valley routes to the Mediterranean region. On the other hand, Casson (1984) has argued that it was the people of the Somali coast, who received the Austranesian spices and passed them to the interior and to the Red Sea. The find on the Tanzanian coast, on one hand, of remains of trade goods and domesticates of South Asia/Indian and, on the other hand, of the Red Sea/Mediterranean regions, dating back to the last millennium BC, would suggest that East Africa rather than Somalia or both would have played a major role in transferring the spices. In fact most of these trade items are found in caves. This fact corroborates Pliny's correction of Strabo that it was the cave dwellers of East Africa who brought spices from far in the ocean and passed them to the Red Sea. The actual location of the Azanian capital of Rhapta remains ambiguous. However, archaeological indicators reported above suggest that it was located on the coast of Tanzania, in the region of Rufiji River and Mafia Island. It is in this region where the concentration of the Paanchea/Azanian period settlements has been discovered. Also according to the Periplus, if the island of Menuthias was Zanzibar, the peninsula after it would have been Dar-es-Salaam and a further sail past this peninsula would land one in the Rufiji region (see Datoo 1970; Kirwan 1986; Casson 1989). Ptolemy puts Rhapta at latitude 81, which is the exact location of the Rufiji Delta and Mafia Island. The metropolis was about one degree to the interior near a large river and a bay with the same name. While the river should be regarded as the modern Rufiji River, the bay should definitely be the calm waters between the island of Mafia and the Rufiji area. The southern part of the bay is protected from the deep sea by numerous deltaic small islets separated from Mafia Island by shallow and narrow channels. The north is opened to the sea and any sailor entering the waters from the north would feel like entering in a bay. Even today the residents identify this waters as a bay referring it as a "female sea" as opposed to the more violent open sea on the other side of the island of Mafia. The doyen of East African coastal archaeology, Neville Chittick was quite convinced that Rhapta was in the area of the Rufiji River. As noted earlier, his suggestion that the metropolis remains are now buried in the ocean, near the mouth of the river, where he surveyed, may not be acceptable in view of the information provided by Ptolemy. Since the location was put one degree away from the ocean, it would seem that the settlement was about 40 km or further to the interior. In this region larger ancient settlements, some with trade remains from the Mediterranean world, have been recovered (Chami 1999b). Future research in this general region may widen the knowledge now we possess about Rhapta and Azania. The last point for discussion is the possible interior trade link between the coast of East Africa and the Nile valley. It was noted earlier that Strabo did suggest that cinnamon and cassia reached the Mediterranean region via the Sudd of Nile, south of Meroe. Pliny suggested that the origin was from the coast of East Africa. Miller (1969) has argued that there was an interior route from the coast of East Africa to the Nile Valley. This idea has been seconded by this author (Chami 1999a) who argued that the route may have gone through central Tanzania to the Great Lakes region. The point, which has to be made here, is that when the Mediterranean states failed to reach the south-east Asian products through the Red Sea, due to the growing powers of Arabs or Persians, other routes were always explored. The most recent experience is that of the 16th century European (Mediterranean states) who had to circumnavigate Africa from the Atlantic Ocean via the Cape to get spices from south-east Asia, in order to avoid the Muslim blockade of the eastern Mediterranean Sea and the Red Sea. Also to avoid Sasanians who dominated the northern Indian Ocean waters in the 4th- 6th centuries AD, according to Cosmas Indicopleustus (see Freeman-Grenville 1975), Aksumites used an interior route to trade with East Africa. It is likely that before the rise of the Roman power in the Indian Ocean an interior route via Meroe had been used to reach the Indian Ocean and obtain goods from south-east Asia. This is probably the report found in Strabo. Also the story of Eudoxus that people of the Western Mediterranean Sea, at Gades in southern Spain, had circumnavigated Africa from the Atlantic Ocean, via the Cape, is another example. This could have occurred during the time of Persian power over the Eastern Mediterranean and the Red Sea. A sliver of evidence concerning a pre-Roman route to East Africa via Meroe is that Emperor Nero in the 1st century AD was sending expeditions to the source of Nile. One reason for it was to find out if the trade route operating there was still functioning. The mission came up with a report suggesting that the route had shifted to the Red Sea (Welsby 1996). The implication of this report is that goods figuring in this route must have originated from the coast of East Africa, because they could easily be re-routed through the Red Sea. Additional circumstantial evidence is provided by Diogenes' journey from the coast of East Africa/Rhapta to the source of Nile (Huntingford 1980). Diogenes must have been following a trade route to the deep interior. Whereas his mission could have been exploratory reminiscent of the recent historical explorers, another objective could also have been to spy whether the trade route continued to the Nile Valley. In view of the new archaeological data from the coast of Tanzania one can now start reassessing the shift of trade routes from time immemorial in relation to various power politics of the ancient times. It is when Sub-Saharan Africa is placed in the context of the Ancient Classical history with more positive involvement that a better picture of these trade routes will be made clear. This work has attempted to put East Africa or Paanchea/Azania in the context of the Graeco-Roman world via the Red Sea. This has been done using the most recent archaeological finds from the Tanzanian coast. The data has been collated with Graeco-Roman reports in order to offer a clearer reconstruction of the relations between the two regions. It has been shown that the coast of East Africa had Late Stone Age/Neolithic communities established probably from about 3000 BC. These communities, apart from hunting wild animals and fishing, did domesticate animals such as chicken, dogs and cats. It is likely that plants such as coconut and banana were also domesticated. It is at this time of Neolithic that these East African communities entered in trade relations with the north reaching the Mediterranean regions and with the east reaching as far as south-east Asia. The Indian Ocean islands, for example Zanzibar, were then occupied by such Neolithic people. These are people reported by Iambulus and other Greek writers having a capital called "Panara". The new era came with the adoption of iron technology in the early centuries AD or slightly before. The communities of East Africa grew in size and now began trading with the Romans and people of Arabia. People were more cultivating and more settled. These are people trading with the Romans via the Red Sea, with their capital identified by the Periplus and by Ptolemy as Rhapta. The culture and the economy of these people spread quickly to the deep interior and as far south as southern Africa. The core of these communities may have been in the Rufiji-Mafia region where many sites of that time period are found some with remains of trade goods from the Mediterranean region. It has been noted that in different time period of the East African history, trade routes changed depending with power politics of that time period. There were times the northerners reached East Africa through the interior routes and another time through the Ocean via the Red Sea. As trade routes are difficult to show archaeologically, this may take longer to demonstrate. Allen, J. de V. (1983) Swahili origins, London: James Curry Ltd.
Begley, V. and de Puma, R., eds (1991) The ancient sea trade, Delhi: Oxford University Press. Cary, M. and Warmington, E. (1963) The ancient explorers, Middlesex: Penguin Books. ________(1984) Ancient trade and Society, Detroit: Wayne State University Press. _________ (1989) Periplus Maris Erythraei. Princeton: Princeton University Press. _________ (2001) Chicken bones from a Neolithic limestone cave site in Zanzibar, People, Contacts and the Environment in the African Past (Chami, F., Pwiti, G., and Radimilahy, C., eds), 84-97, Dar-es-Salaam: Dar-es-Salaam University Press. _________ (2002a) People and contacts in the ancient western Indian Ocean seaboard or Azania, Man and Environment (special theme on the Indian Ocean in Antiquity) 26/2. _________ (2002b) East Africa and the Middle East relationship from the last millennium BC to about 1500 AD, Journal de Africanistes 72, 1-2. Chami, F. and Kwekason, A. (2003) Neolithic pottery traditions from the islands, the coast and the interior of East Africa, African Archaeological Review 20/2. Chami, F. and Wafula, G. (1999) Zanzibar in the Neolithic and Roman time=, Mvita 8,1-4. Chittick, N. (1966) Six early coins from near Tanga, Azania 1, 156-57. _________ (1980) Pre-Islamic trade and ports of the Horn, Proceedings of the eighth Panafrican Congress of Prehistory and Quarternary Studies (Leakey, R. and Ogot, B., eds), Nairobi. Chittick, N. (1982) Reconnaissance in coastal Tanzania, Nyame Akuma 20, 57-58. Cinimo, R. M., ed. (1994) Ancient Rome and India, New Delhi: Munshiram Manoharlal. Datoo, B. A. (1970) Rhapta: the location and importance of East Africa's first port, Azania 5, 65-77. Dubin, L. (1987) The history of beads from 30,000 B.C. to the present, London: Thames and Hudson. Ehret, C. (1998) An African Classical Age, Oxford: James Curry. Horton, M. (1990) The Periplus and East Africa=, Azania 25, 95-99. Huntingford, G. (1980) The Periplus of the Erythraean Sea, London: The Hakluyt Society. Jones, H., transl. (1960) The geography of Strabo, London: William Heinemann. Kendall, T. (1997) Kings of the sacred mountains: Napata and the Kushite 25th Dynasty of Egypt, Sudan: Ancient Kingdoms of the Nile (Dietrich, W., ed. ), 161-228, Paris: Flammarion. Kirwan, L. P. (1986) Rhapta, metropolis of Azania, Azania 21, 99-114. Kitchen, K. (1993) The land of Punt, The Archaeology of Africa (Shaw, T., Sinclair, Andah, B. and Okpoko, A., eds), 587-606, Routledge: London. Mapunda, B. (2002) Iron metallurgy along the Tanzanian coast of Southern Africa and the Swahili World (Chami, F. and Pwiti, G., eds), 76-88, Dar-es-Salaam: University Press; Studies in the African Past 2. Miller, J. (1969) The spice trade of the Roman Empire, Oxford: Clarendon Press. Oldfather, C. , transl. (1961) Diodorus of Sicily, London: William Heinemann, vol. 2. Phillips, J. (1997) Punt and Aksum: Egypt and the Horn of Africa, Journal of African History 38, 423-57. Rackham, H., transl. (1961) Pliny: natural history, London: Harvard University Press. Schoff, W. (1912) The Periplus of the Erythraean Sea, New York. Smith, M. and Wright, H. (1988) The ceramics from Ras Hafun in Somalia: Notes on a Classical maritime site, Azania 23, 115-42. Tylecote, R. (1976) A history of metallurgy, London: The Metals Society. Welsby, D. (1966) The kingdom of Kush, London: British Museum Press. Whitehouse, D. and Williamson, A. (1973) Sasanian maritime trade; Iran 11, 29-49. I am Maldonado,from what I can read. It has been sad news and scam to everyone about Voodoo casters or so. But to me they are so real because one worked for me not quite long ago.i met this man on a blog his name is Dr Abalaka is a very powerful man.I traveled down to where his shrine his and we both did the ritual and sacrifice.he had no website yet but he promised to create one as costumers are requesting for it, and now i'm free from the powders of sickness.I don't know about you but Voodoo is real;love marriage,finance, job promotion ,lottery Voodoo,poker voodoo,golf Voodoo,Law & Court case Spells,money voodoo,weigh loss voodoo,diabetic voodoo,hypertensive voodoo,high cholesterol voodoo,Trouble in marriage,Barrenness(need a child),Luck, Money Spells,he also cure any cancer and HIV,it's all he does. I used my money to purchase everything he used he never collected a dime from. He told me I can repay him anytime with anything from my heart. Now I don't know how to do that. If you can help or you need his help write him on (dr.abalaka@outlook.com) and also his cell number: 760-935-3804 you can text him because he use to be very busy some times,i believe that your story will change for better,or if you have any question you can contact me here as 1001madonado@gmail.com best of luck.